Names are the most important piece of print for young children. These words are usually the first thing kids learn to read and write. Tonight I saw an article about the up and coming names for 2010. Gee whiz! I’m going to need help pronouncing and spelling some of these in the next few years! For more information, check out www.parentdish.com… For ideas on using kids’ names for word study, see my book, Beyond the Names Chart from Really Good Stuff. Beyond the Names Chart is Here! The long-awaited book, Beyond the Names Chart: Using Children’s Names for Word Study, has just been published by Really Good Stuff. This book is for K-2 and shows how to use kids’ names to help them learn phonics skills. Check it out! 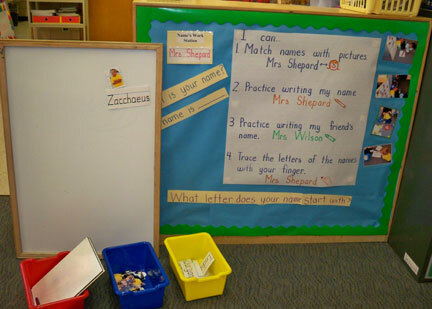 Here’s a picture from Denver Public Schools showing a names work station in kindergarten.